I like to organize with binders. I find it the best way to keep track of important papers and projects. I’ve been like that since my school days, and as a matter of fact, my first boss in the real world nicknamed me “the binder queen” after I meticulously organized her entire office using only binders. So when I heard of a calendar system from Dodo Pad that works with binders, I was excited to give it a try! 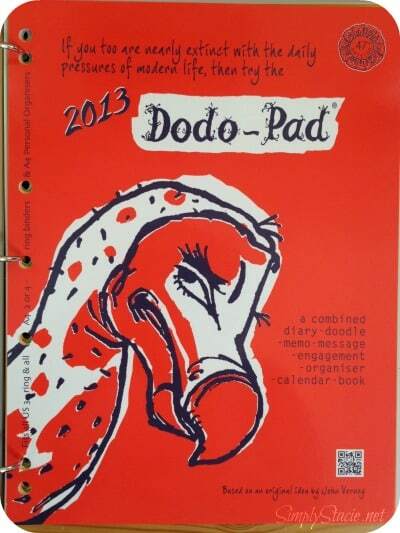 Dodo Pad sent me two calendar systems for review – Lord Dodo’s Academic Mid-Year Diary Planner and a Calendar Year Diary. Both systems fit nicely into standard 3-ring binders, as well as A4 sized binders. The year is broken down into weeks, with each page having ample room to pencil in activities, important dates, and even doodles! There are quirky facts throughout the planners that make them interesting and fun, including things like Hugh Hefner’s birthday, and the date of the first meeting of the Cat’s Protection League. There are also fun little illustrations on each page. These planners are anything but boring! I like that there’s a lot of space for notes, clipping on invites, etc. 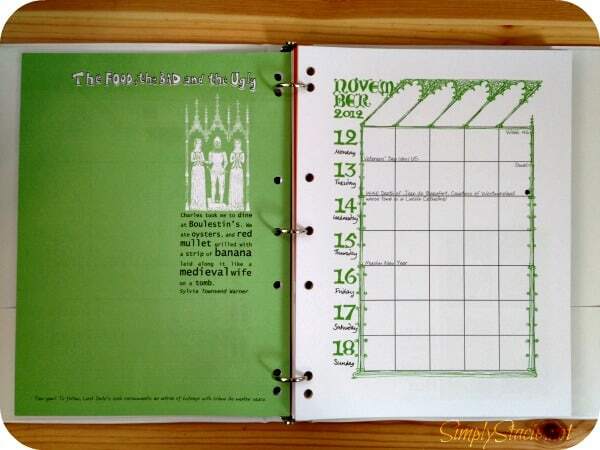 The Calendar Year Diary runs January to December, while the Academic Mid-Year Diary Planner runs September to August. Both calendars are just over $20 US. Dodo Pad was created back in 1966 as a weekly planner grid solution to life’s dates and deadlines. It was created to be almost impossible to lose, due to its size and brightly colored cover. As the years have gone on, the Dodo Pad has taken on the needs of the modern consumer and now offers more than just calendars. Dodo Pad also has greeting cards, pet care organizers, garden planners, recipe book organizers, mugs, pens and other stationary. With its playful design, Dodo Pad products are the perfect gift for college kids, executives, moms – anyone who needs to stay organized and likes to have a little fun with it! You can see the full line of Dodo Pad products on their website. So glad you liked our products! Sorry you didn’t win… but you can use this code ’12PR’ at checkout for a one time 10% discount off your purchase – it’s valid up to 31st March 2013. Excludes items already discounted or on special offer. So glad you liked our products! Sorry you didn’t win… but you can use this code ’12PR’ at checkout for a one time 10% discount off your purchase – valid up to 31st March 2013. Excludes items already discounted or on special offer. So glad you liked our products! Sorry you didn’t win… but you can use this code ’12PR’ at checkout for a one time 10% discount off your purchase: it’s valid up to 31st March 2013. Excludes items already discounted or on special offer. I like the pink iphone case. We’re so glad you liked our products! Sorry you didn’t win… but you can use this code ’12PR’ at checkout for a one time 10% discount off your purchase – it’s valid up to 31st March 2013. Excludes items already discounted or on special offer. I love The Dodo Book of the Precious Pet!